The Germans and Austrians have long dominated the top-end binocular market and rightfully so. There was a clear difference in quality and no others challenged their wares. Traditionally, the most critical buyers and those who demanded only the best sports optics needed look no further than the top three European manufacturers. Well, the world has changed. 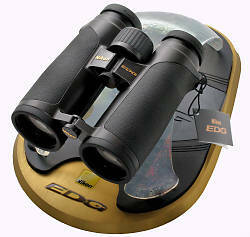 Be there no question, with the introduction of the new Nikon EDG binoculars, the top trio is now a quartet. Nikon is well known in the camera world as one of the finest optics manufacturers. In the case of the EDG II binoculars, that expertise comes through in flying colors. Bright, vivid, gripping colors. For you “Nikonites”, the EDG II is the binocular you’ve always waited for, and maybe for the rest of us too. What you see is the single most crucial factor in evaluating any binocular, barring any glaring problems in their basic function. The new EDG II binoculars stand out optically in all aspects. It is the richness of the image, the sharpness, the stunning detail that makes a profound impression. The quality of the view puts these binoculars in a very elite class. The EDG II name was derived from ED Glass which is ‘extra-low dispersion’ or ‘extra-high density’ glass – however you want to think of it. This type of glass is often seen in high- end spotting scopes and camera lenses and is appearing more often in binoculars. ED glass reduces the scatter and separation of the different wavelengths of light so that they all arrive simultaneously on the same focal plane: your pupil. This limits the green/magenta color fringes, called chromatic aberration, around high-contrast objects and at the edges of the field. You will also see a difference in something that you might not associate with chromatic aberration: its absence results in a sharper image. Another impressive optical quality of the EDG II binoculars is their extensive depth of field. This is one of those things that we rarely write about because it is so hard to quantify. When you have focused on a particular object, depth of field comprises all that is in focus both in front of and behind that object. 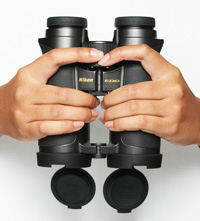 Binoculars with shallow depth of field cause the user to constantly adjust focus, particularly with objects closer to the observer. Additionally, with a shallow depth of field, the user must be more precise in focusing since there is less room for error. Greater depth of field results in an enhanced three-dimensional perspective. While small differences in depth of field are virtually impossible to quantify, big differences are readily apparent. The EDG II binoculars have simply stunning depth of field; in this, they exceeded all competitors. Still another property of the EDG II binoculars is their huge field of view. Nikon published the following numbers for the field of view at 1000 yards: 419 feet for the 7x42, 403 feet for the 8x42, and 341 feet on the 10x42. All of those are about average for 42-mm binoculars at those respective magnifications. So the numbers look good although in our experience, what a manufacturer says and what it means in terms of field performance are difficult to measure, and sometimes hard to even see. What we can say is that we tested them in the field and they did have a larger usable field of view than their competitors. The incredible image quality and extensive depth of field mean that, with the EDG II you see more of what you’re looking for than with most high-end binoculars. Image brightness always ranks very high on the list of critical optical performance parameters. Many factors combine to produce image brightness, ranging from the quality of glass and coatings to the physical assembly of the prisms, and so on. When looking strictly at image brightness, the EDG II binoculars, though bright, were not the brightest binoculars we tested. We qualify this last statement: the EDG II are very bright and of those we tested, only one binocular was marginally brighter. That being said, it was a big surprise to us that, despite another binocular delivering a brighter image, the EDG II consistently outperformed the brighter binocular. The EDG II produced more image detail and greater richness than the brighter binocular in all light conditions. We’re still not even sure how that is possible! But we all saw it, and seeing is believing, right? In reading the published specifications for the EDG II, one number really turned us off: the 9.8-foot minimum close focus. We use our binoculars to observe nature and we want to look at everything from birds to butterflies, bugs, flowers or moss on trees… If we have to be 10 feet away to focus, we just can’t see details on small things or get close enough to see subtle features. Minimum close focus is something that manufacturers often seem overly conservative with, perhaps because perception of it varies with the observer. We often qualify our discussion of close focus by noting the distance at which the visual field deteriorates either by separating into multiple images or going partially dark. With that in mind, we don’t know how Nikon got 9.8 feet for their minimum close focus! All of us got down to about 7 feet plus or minus an inch without any visual field collapse. While 7 feet isn’t the world’s shortest minimum close focus, it’s good enough, and it’s a lot better than 9.8 feet! In flat-field performance, the EDG II binoculars are good, though not as good as their cousins, the Nikon Premier LXL, which are pretty much the best ever in this character. There was almost no detectable pin-cushioning or barrel distortions (see the All About Optics section on the site for definitions). The distortions were negligible overall, even at field edge where all binoculars show some. Stepping back, one of the first things you’ll notice about the EDG II is that, unlike the original EDG, it no longer has an “open bridge” or “double-hinge” design. This change was forced by a patent infringement case. 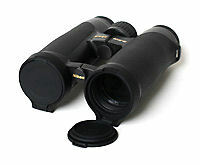 EDG binoculars are offered in five different models: 8x and 10x32, and the 8x, and 10x42 versions. We won’t say much about the 32-mm EDG II models since that’s a subject for a separate review. The 42-mm versions are of average dimensions: 5.1 inches wide by 5.9 inches tall with eyecups fully down, (6.4 inches with them up). The 8x EDG II weigh in at 28.6 oz. and the 10x model at 28.9 oz. This is slightly greater than the 25-26 oz. we would prefer to see in a top 42-mm binocular but the EDG II are so well-balanced and comfortable in hand that they just don’t feel as heavy as the scale says they are. This brings up two things that are worthy of note: the first is balance. How a binocular distributes its weight in your hand determines how much fatigue it causes in your arm. Our review team spent long days birding with the EDG II (is this a great job, or what!) without significant fatigue. If someone actually experienced neck fatigue, it could be quickly cured by using a harness. The second thing we need to comment on is shape and external coating, which affects how comfortable a binocular feels in the hand. The soft rubber armoring of the EDG II has the same almost-sticky feel to it that the Premier LXLs had. We happen to like it, and see it as a plus. There are also thumb recesses well positioned on the underside of the barrels for greater comfort. 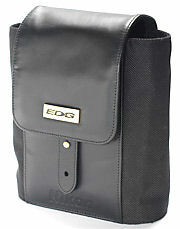 The EDG II have a magnesium body, touted by Nikon as ultra durable. Additionally, the EDG II are fully sealed and nitrogen-purged to be waterproof, dust-proof and internally fog-proof. Other physical properties include eye relief, which is more than adequate for all models, at 19.3 mm and 18.0 mm for the 8x and 10x respectively. The 42-mm EDG II binoculars go from minimum close focus to infinity in a zippy 1.2 turns of the focus knob, with an action that is smooth and effortless right out of the box. You have to score them highly for focusing speed and ease. The eyecups adjust helically, with three positions in addition to fully-in, all marked by nice, firm detents. The eyecups were very well executed and engineered. Included in the box are also soft rubber wrap-around eyecups that can help reduce stray light from the sides for non-eyeglass wearers. EDG II binoculars have a large interpupillary distance range of 53-74 mm. This is very nice, especially on the low end, where people with close-set eyes often have trouble finding binoculars that fit their face. The diopter adjustment on EDG II binoculars is built into the focus knob and is accessed by pulling the knob upward from the hinge to expose the dial that adjusts the diopter. That dial has a nice action and is clearly marked, and while it doesn’t lock in place, it doesn’t need to since it is hidden by the focus knob. Integrated center focus/diopter mechanisms are becoming more common, especially in high-end binoculars. We think this design has downsides relative to locking diopter controls located on the oculars. In the initial version of the EDG II, the focus knob popped up way too easily and disengaged focusing. Nikon fixed this in the more recent models. This doesn’t negate the issues we have with center focus/diopter adjustments, but at least it is a vast improvement over the previous version. Another thing Nikon fixed with their recent upgrades to the EDG II is the rain guard. The first one was very innovative but ultimately unsuccessful. The old rain guard was made of hard plastic that clacked noisily against the binocular as one walked. This rain guard has been replaced with a soft rubber one that fits a bit loosely over the oculars but adequately covers them. It’s simple, effective and a big improvement. 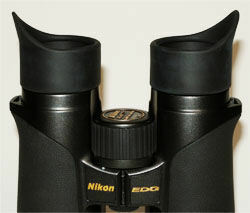 Nikon also included “winged” eyecups for users who don’t wear glasses as standard equipment with the EDG II binoculars. Although the rain guard does not fit over them, Nikon anticipated this limitation and thoughtfully provided two hard plastic caps that fit fairly snugly inside these eyecups. It is another nice addition that Nikon provides as standard equipment rather than as an accessory to be purchased. Some people will like them and use them, and others won’t, but at least everyone gets the option. We give them high marks for anticipating users needs. The objective lens caps are hinged and they fit onto a stiff rubber ring that attaches over the barrel ends. These lens caps swing out when the binocular is in use or snap closed; in that, they work pretty well. The issue is that when they are open, they tend to snag on things, often pulling the entire assembly, cap and ring, right off. Since you don’t always know that this has happened, in effect, they tend to promote the one thing they were designed to prevent: loss of lens caps in the field. So this was a good idea that needs a bit better execution. We hope Nikon is generous about replacing these upon request until they figure a fix for it. The strap is a hybrid of neoprene rubber and wide cordura that tapers down to fit through the well-positioned lugs on the sides of the barrels. It is fairly comfortable by itself, though some users may still prefer a harness-type strap. Lastly, there is the case, which is made of soft leather and cordura and is well padded inside. We have qualms about the elaborate flap-closure mechanism. The flap has a strap with two holes in it that fit over a small post riveted into the outer portion of the case. A double-toothed clasp of the type common on backpacks would have been better. While the case is very classy overall, Nikon over-engineered it, and a simpler approach could have been a lot more functional. Then again, no one buys binoculars this good for the case! 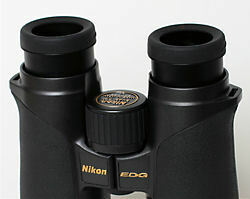 The Nikon EDG II binoculars are priced quite reasonably for high-end binoculars. The lowest internet price you can expect to find is $2,399.95 for the 8x42 EDG II and $2,499.95 for the 10x42. Price and performance make the EDG II an appropriate choice for those who demand nothing but the best. 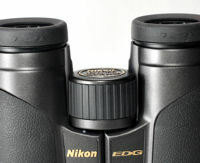 Overall we are extremely impressed with the Nikon EDG II binoculars. Their optical performance meets or exceeds that of the best binoculars on the market today in every aspect. The design is innovative and thought out down to the finest detail. They are razor sharp, bright, clear and vivid. The amazing depth of field seemingly inserts the viewer in the view. The EDG II binoculars are more than just Nikon’s entry into the high performance binocular market: they are the cutting edge. Nikon has discontinued the EDG II binoculars, but a few are still available. If you've had them on your wish list, now is the time to act before they are all gone.